The first public beta version of Bitdefender Total Security 2015 has been released to provide a preview of the next generation of Bitdefender’s technology. 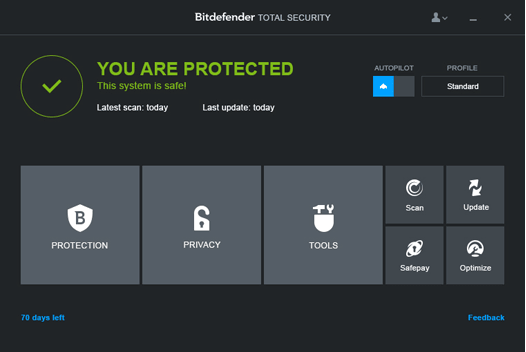 The main highlight of Bitdefender Total Security Beta 2015 beta is the revamped interface, the new UI will automatically adapt to different resolutions and according to Bitdefender, it works fluidly on any touch screen device. With the revamped interface, now the main tasks such as Quick scan, Update, Open Safepay and Optimize PC are just one-click away, also through the 3 main tiles you can access other security functions such as Protection, Privacy and Tools. Bitdefender Safepay, a desktop browser that provides secure browsing environment and protects from online fraud, is now integrated with Wallet. To make the online transactions more easier, it can now automatically fill passwords , user names and credit card details. In Bitdefender Total Security 2015, the vulnerability Scanner will spots risks in installed applications much faster than previous version and offers fixes, links for downloading the patches or updated version. Activity Profiles are introduced in this version, this feature checks the functioning of your PC and automatically adapts or optimize your system to different situations.If you are a gamer, the security suite automatically switches to Game Profile When you play games on your PC. This Game mode will disable unnecessary services, non-essential security tasks and offers uninterrupted game-play. In a similar way, a Movie Profile will be enabled when you are playing movies on your system.This profile will enhance visual effects and optimizes the suite settings to let you watch movies without any disturbance. Also, the work profile is there to the boost the performance on work apps. 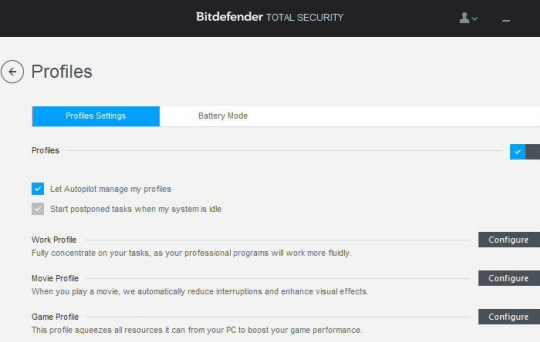 If you are using Bitdefender Total Security 2015 on a laptop, the Battery Mode profile will be enabled when your Laptop battery level is below 30% ( default value) and this mode will disable external devices, network ports, adjusts poser plan settings and tunes the security suite settings to save energy. The 2015 version also introduces a new feature called ‘Bitdefender One-click Optimize’, with one single click it will frees up disk space, optimizes your browser and repairs broken registries. Also the Tune-Up module has been revamped, now it offers a six more tools that include Disk Defragmenter, Duplicate Finder, Registry Recovery , Registry Cleaner, PC Clean-Up and Boot Optimizer. Other significant features or changes in the new version are : cloud-based Parental Control system, lightweight and Autopilot mode improved further to offer you get zero configurations or interruptions. This a first beta or early preview of upcoming Bitdefender’s security suite, so it will have significant issues and its not recommend to run it on a regular working system. If you wish to test this beta, you can get it from below link.Also for beta testers who offer feedback on this product will get great prizes, Bitdefender is offering prize that include Samsung Galaxy S4 Smartphone, Microsoft Surface PRO 2 Tablet, one Bitdefender Lifetime Edition license and 100 Bitdefender Internet Security Licenses. Update : Get a 6 month license of Bitdefender Total Security 2015 for Free.